Now this one is really easy. I can think of only one “fighter anime” which I have ever seen. As anyone who knows me is probably giving me one of those uncomprehending “looks” right now, as I tend to love everything in the action genre, allow me to explain how this is possible. In part, it’s just luck of the draw. Purely by coincidence, I have not stumbled into any other fighter anime at a time when I’ve been able to watch them. On the other hand, there’s a certain amount of choice involved. I’ve never gone looking for fighter anime. They’ve just never appealed to me enough to go find them, strange as that may seem. There has been one exception, and I rather like this anime. See, the focus of Kenichi isn’t really the fighting. It’s a useful tool, a vehicle for the story, but the story isn’t about fighting. It’s about what the fighting is about. The question is simple: what is worth fighting for? For the protagonist, Kenichi, he has typically been bullied at school, so he learns some martial arts, so he can stand up for himself and others. Small detail: he manages to half-stumble into full-fledged discipleship at a dojo which houses half a dozen world-class masters of various martial arts. As their only student, he is the sole object of their absolutely merciless – nay, sadistic – attentions. Virtually every hour of every day is taken up with torturous exercises that increase his strength in leaps and bounds, with only the slight detriment of possibly killing him instead. 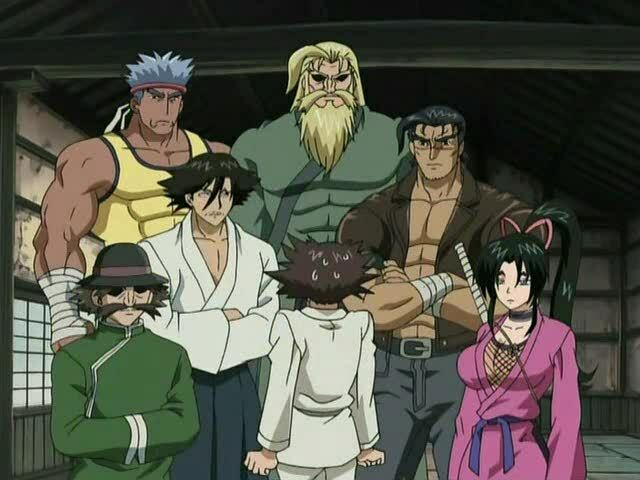 Kenichi stands before the masters of Ryozanpaku, and is justifiably nervous, as they are the most terrifying people he will ever meet, including his enemies. And how does he manage to do this? Well, he sort of got a little too close to the dojo master’s granddaughter, Miu Furinji, on his way to school and she, by reflex, punched him in the throat. Developing an instant crush on his adorable (if also lethal) classmate, he stopped by her home, the dojo. And if what happens next is not a metaphor for enduring Hell the moment you meet the girl of your dreams, I don’t know what is. Though, really, what boy wouldn’t endure Hell for this girl? From there, as Kenichi’s strength grows, he shines like a light in the eyes of his opponents, many of whom eventually become his allies after he defeats them, a’la Goku. It’s faster for some than others, and some of their allegiances are hilarious to behold. One involves the girls bonding through their love of cats. Another conversion just sort of happens when one of Kenichi’s chief rivals is unwittingly befriended by Kenichi’s little sister. Moving from one foe to another, Kenichi finds himself working his way up to some pretty infamous names in the world of young martial artists. He meets each new foe with all the skill, cleverness, and determination he can muster, and he suffers some crushing defeats, but he always gets up again. From his perspective, defeating (and sometimes converting) his enemies is his way of standing against the biggest bullies on the proverbial block. Of course, there’s also that little detail where he’s defending his life. And for never once going on the offense against any individual or group, he steadily attracts the attention of more and more sinister shady organizations. When you get down to it, this is really only a B-grade anime. The major premises are simplistic, the martial arts rather unrealistic (there is no way to punch someone seven times with one punch), and the coincidences between Kenichi’s childhood and his present ordeals is a bit much to just swallow, but these flaws are easy to forgive. It’s a hilarious, heartwarming, action-packed anime, with a plot that evolves in its intricacy, and memorable, lovable characters. 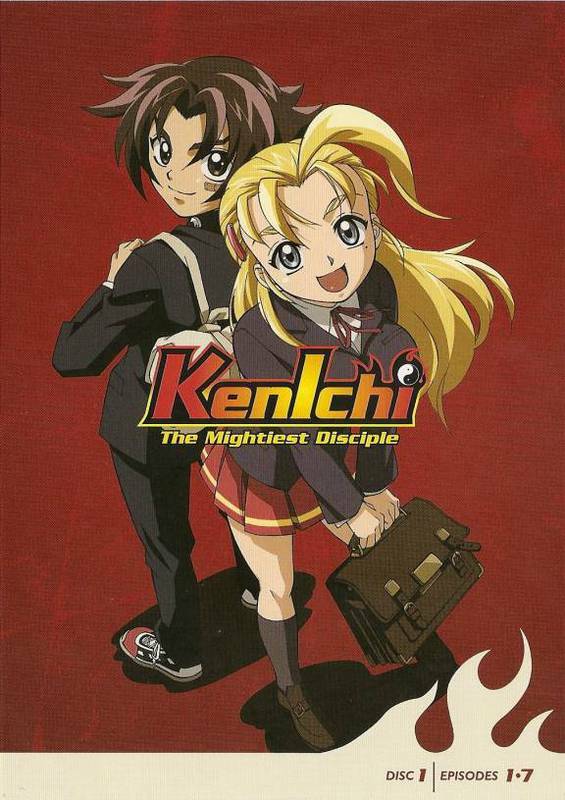 This entry was posted in 30-Day Anime Challenge, Anime and Cartoons, Challenge Accepted and tagged Kenichi: The Mightiest Disciple. Bookmark the permalink.